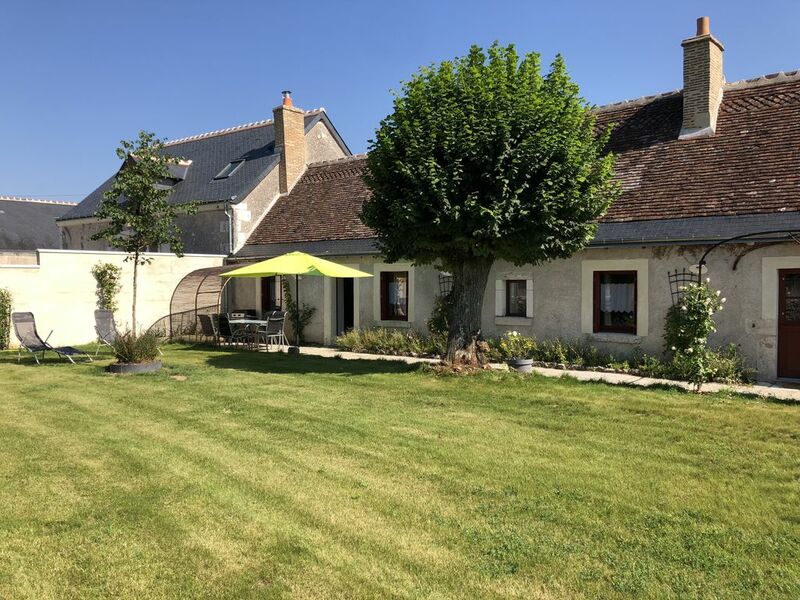 We are pleased to welcome you in a 19th century farmhouse completely renovated with quality materials and with all modern comforts (110 m2), on the edge of the woods of St Jean du Grais and 15 kms from Tours. Our cottage has a large garden with space terrace flowered facing south, conducive to rest in a green. The Clos des Buis (property of 6000 m2), near the hunting lodge of François 1er and a Priory of the 12th century, is at the crossroads of the main castles of the Loire (Chenonceaux: 18 km, Amboise, Villandry: 22 km, Chambord: 70kms). The commune of Azay sur Cher (3500 inhabitants) participates in the regional program of Cher trails by bike, and benefits from all the conveniences (bakeries, tobacco-press, pharmacy, supermarkets and a shop of local products in short circuit opened also the Sunday morning). Fitted kitchen: hob, oven + microwave, dishwasher, fridge freezer, washing machine and dryer, Nespresso coffee machine and filter, toaster, kettle, hair dryer, iron and ironing board, TV, WIFI, CD-DVD player. 2 high chairs + 1 cot for children. SDB N ° 2: bathtub, double washbasin + WC. Floor heating + wood stove. Garden furniture: table, chairs, sunbathing, plancha. Linen provided (beds, towels and tea towels). Wir freuen uns Ihnen unser neue Ferienhaus auf dem Lande anzubieten. Das Gebäude ist ein Farm of 19. Jahrhunderts total renoviert mit Qualitatsbaustoffen, mit modernem Komfort (110 Quadratmeter). Steht zur Verfügung ein grosser Garten, und eine bluhende Terrace Südseite. The Clos des Buis (Grundstück 6000 m2) lies on the Kreuzung von den Hauptschlössern der Loire (Chenonceaux: 18 km, Amboise und Villandry: 22 km, Chambord: 70 km). Die Kommune von Azay on Cher (3500 Einwohner) hat ein Programm am Ufer des Cher mit Radfahrwegen. Im Ort sind: Bäckerei, Tabak und Zeitschriftenladen, Apotheke, und Supermärkten die auch am Sonntag morgen geöffnet sind. Einbauküche mit: Induktion Platte, Backofen und Micro Welle, Geschirrspülmaschine, Kühlschrank mit Gefriertruhe, Waschmaschine und Trockner, Nespresso und Filterkaffeemaschine, Brötzer, Wasserkessel, Föhn, Bügeleisen mit Brett, TV and WIFI, CD-DVD Player. Badezimmer N ° 2: Badewanne mit Möbel mit Doppelwaschbecken + WC. SDB1: Corner bath and toilet SDB 2: in room: Italian shower and separate WC. Paper tissue boxes (chambers) and liquid soap available in the 2 bathrooms and kitchen.